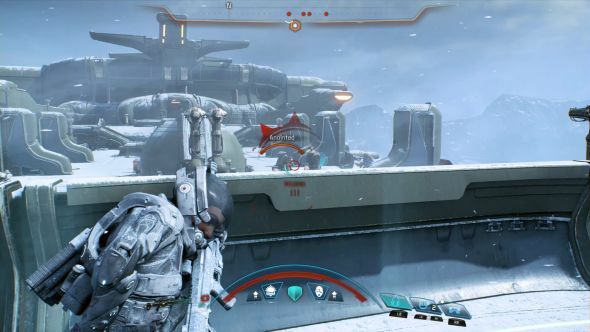 Combat has traditionally played second fiddle to narrative in the Mass Effect series, with Bioware’s interactive dialogue, rich characters and epic storylines overshadowing merely functional fights. Only in Mass Effect 3 did those fights really come alive, with cleverer, more varied enemies, a streamlined leveling system and a nimbler Shepard combining to create some pretty thrilling battles. Who will be by your side, and who will you be shooting? Find out in our Mass Effect: Andromeda character guide. Andromeda takes this further. Mass Effect 3’s successful multiplayer is returning, and new protagonist Ryder will get into plenty of scraps in the story mode. To sustain all this, Andromeda is making a ton of tweaks to your movement around the field, the way you’ll build your character, weapons, and more. 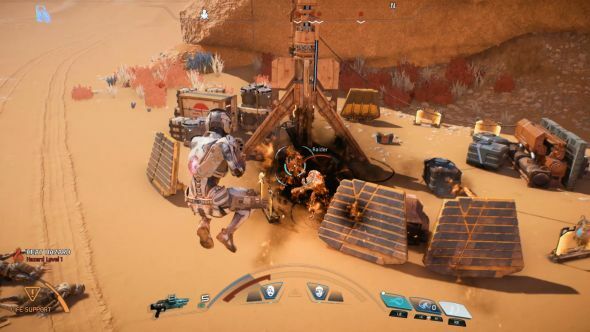 We’ve compiled all the latest info into this handy combat guide, so read on to learn how you’ll slay your enemies in Mass Effect: Andromeda. The jetpack is arguably the most impactful new ingredient. Gone are the days of climbing a clunky ladder to gain higher ground – now you can simply jump there. Even without a specific destination, the z-axis works in a pinch asa quick escape from dicey combat situations. Another tactic is to gain an angle on enemies behind cover by jumping high and then hovering in mid-air, which you’ll do if you aim down sights or use a power. Andromeda replaces Mass Effect 3’s combat roll with a faster, jet-propelled dodge. You can go sideways, forwards or back in a fraction of the time it took Shepard to tumble out of cover, and the short cooldown adds to the sense of agility. Both dodges and jetpack jumps can be modified depending on which profile you have equipped, with one high-rank Explorer perk enabling you to phase through matter. Speaking of matter, Ryder will now hunker down automatically as you press up against cover, rather than requiring a button press. Some cover in Andromeda will also be destructible, so you’ll be able to expose enemies to your fire just by blowing things up. Of course, your opponents can do the same to you, and some will share your own abilities, including jump jets and invisibility cloaks. All these changes combine to make the most lively, mutable battlefield in the series yet, but on the plus side, you’ve never been better equipped to react to those changes – you’re more mobile and more agile than ever, with a new vertical axis of movement at least partially opened to you. Finally, power combos return. This was a feature in Mass Effect 3 (or Mass Effect 2, if you count Warp detonations), in which certain powers could ‘prime’ a target, and others could ‘detonate’ a target which had previously been primed. Different explosions were possible depending on the powers used in the combo, with varying elemental effects (fire, cryo, biotic and tech) being only the most obvious of many subtle distinctions. Fire explosions would do double damage against armour, cryo explosions could slow enemy movement, and so on. Making deliberate use of power combos is a more advanced tactic than simply spamming out powers. On lower difficulties, it’s more of a bonus, but it becomes almost necessary on Insanity, when deploying the correct power combo is one of the best methods to shred the shields or armour of powerful enemies. Powers have changed in Andromeda. Each is now on anindividual cooldown, meaning they are more readily accessible. Also,any detonator will work with any primer. Taken together, this means it’s much easier to set up and detonate combos. That’s just as well, since you can’t order your squadmates to use their powers manually any more, so setting up combos is now up to you. You use skill points earned when you level up to buy new skills. 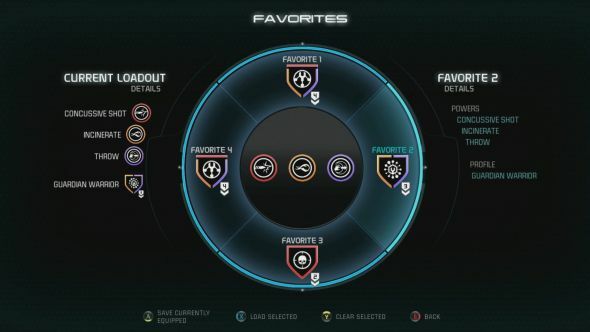 Unlike in previous games, skills aren’t limited by your class; now you can pick and mix freely across the three familiar categories: combat, tech, and biotics (if you’re wondering how such ready access to biotics is explained in the lore, lead designer Ian Frazier says both Ryder twins have innate biotic potential, but the one you don’t play doesn’t develop it). Some key powers within those categories are locked according to previous investment in them: you’ll need to spend nine points in tech before you can unlock the tactical cloak, unless you choose operative training at the start of the game. In all three categories there are active skills – powers which must be activated – and passive ones, like weapon skills, which are always at work once unlocked (regardless of your profile). Each skill has six progressively expensive ranks, with the last three offering a choice of two upgrades. The original trilogy’s six classes were associated with different mixes of skills. It’s the same with Andromeda’s profiles, which share their names with the original classes, and which draw on the three skill categories in comparable ways. For instance, the Vanguard profile is a mix of biotics and combat. To unlock it in Andromeda, you’ll need to spend three points on both biotic and combat skills. For a profile that only draws on one skill type – such as Soldier, which is all combat – you need to spend those six points in that type alone. Andromeda brings a new profile to the mix: Explorer. Instead of being 100% of one category or 50% of two, it’s 33% of all three, and unlocks with two points invested in combat, tech and biotics. 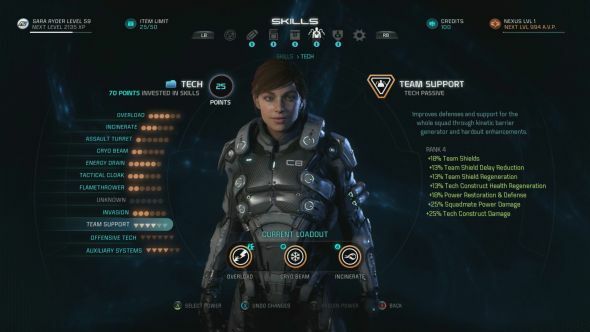 Bioware are going for both depth and accessibility in Andromeda, and Explorer seems like a nod to the latter – if you’re not at all interested in delving into profiles or skill trees, you can just pick Explorer and forget the system exists, basically. But that’s probably not you, or you wouldn’t be reading this guide. Each profile confers a few bonuses when you have it equipped, and profiles rank up as you invest more in the skills they draw on. As they do so, they get unique names and stronger buffs. Each profile has six ranks and there’s no level cap, so you could theoretically unlock every single skill in the game, though this won’t be possible until well into a second playthrough. As jacks-of-all-trades, Explorers get small bonuses to weapon damage, damage resistance, tech charge speed, and biotic damage. At higher ranks, they get the biotic blink ability, which enables them to dodge through walls. Vanguard profile bonuses include extra melee damage and biotic effects whenever Ryder jumps or dodges, though this may only be cosmetic. At higher ranks, they get the ability to recharge their shields whenever they melee attack. Infiltrator passives include tech recharge speed, weapon accuracy and stability, and critical hit damage. At higher ranks, they can see enemies through walls when scoped in, and trigger a brief, automatic cloak when they dodge. 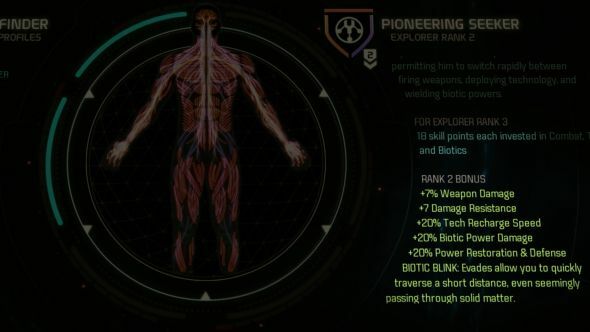 Adept passives include bonus biotic force, biotic area-of-effect damage and radius, and biotic effect duration. Higher-rank effects include bonus explosions when triggering biotic combos. Soldier passives include bonus weapon damage, accuracy, and magazine size, while higher-rank effects include an escalating damage bonus for each target killed in a short time. Most of your old favourite skills return, but some have been reworked (Energy Drain is now a projectile, rather than a hitscan, but it still lets you recharge your shield while hurting the enemy and is therefore still amazing). Others have been merged, and others are new – Invasion is a tech power that infects enemies with a VI-controlled machine swarm, weakening their defence. It spreads to nearby enemies when upgraded. If you’re not happy with your build at any point, “full re-specs are available in the Tempest medbay,” says Ian Frazier. They cost credits, but the first time is cheap. And they’re available for your squadmates, too. You can’t equip more than three active skills (or powers) at a time. What you can do is save up to four different power loadouts as ‘favourites’, and change between them at any time, even in the heat of battle. Simply bring up the weapon wheel, and access the favourites wheel with a further button press from there. You’re still pulled out of combat a bit, but it lets you switch relatively quickly between 12 powers across four loadouts, which you could tailor to particular scenarios. You can watch this in action in the second combat gameplay trailer, in which the narrator discusses switching between different power loadouts to handle different enemies at varying ranges: he primes a Kett with Cryo Freeze, then detonates him with Lance for some splash damage to weaken nearby mobs. Taking on a large alien fiend requires a different set of skills – here he focuses on trip mines and other single-target damage powers. Switching favourites is the only way to access more than three abilities in combat, except for us on PC – we can hotkey particular powers directly. If you like playing with a controller, we found in our hands-on with the game that it’s capable of handling both forms of input pretty seamlessly. On our demo rig, we could put down the controller, put our hands on the WASDs and the mouse, and have the game respond to the new input immediately, with no need to go through a settings menu. Even the tooltips and UI elements switched from showing controller buttons to keyboard keys. You can also switch profiles in the middle of combat, though doing so will cause all “creations” from previous profiles – such as assault turrets and lingering biotic powers like Singularity – to disappear. It also puts your currently equipped powers on a cooldown, and these vary with weight, profile and certain skills (see next section), so switching profiles is a more drastic measure than switching favourites. Bear this in mind if you decide you need a particular profile’s buffs. Your preferred tools of destruction also have an impact on your loadout. 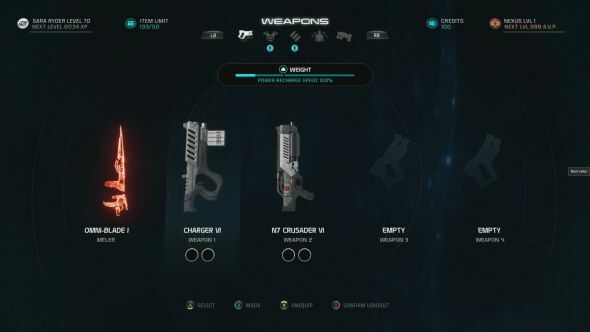 A weight system very similar to that of Mass Effect 3 is back, so if you fill your holsters with heavy guns, expect your powers to recharge more slowly than usual. Soldiers who do most of their talking with guns won’t mind this, whereas Adepts who’d rather pummel enemies with space magic may want to leave everything but a light pistol behind. Holsters are a thing, by the way: unlike Mass Effect 3, you don’t have five weapon slots available from the off. Instead, you start with a melee weapon, and two ‘holsters’ for your guns. You unlock new holsters (among other things) via the Combat Fitness passive skill. As hinted by Ian Frazier above, expect certain profiles and passive skills to also reduce your power cooldowns. You can change your equipped weapons and mods both before you head out on missions, or at a loadout table (much like the weapon modding tables in Mass Effect 3). Each gun can take two mods. Let’s wrap things up with a look at the good stuff: the actual guns with which you’ll give the hotheaded Kett some soothing ventilation. Besides melee weapons, there are four categories of firearm – pistols, shotguns, assault rifles and sniper rifles. That’s one fewer than in Mass Effect 3, but many of that game’s SMGs are now grouped under the pistols category. All guns are available to all players – there are no class restrictions. Besides by type, guns are also categorised by origininAndromeda. Weapons from the Milky Way generally use mass effect fields to shoot kinetic slugs, and are good against most non-shielded targets, but depend on ammo. Heleus weapons use tech from species native to Andromeda’s Heleus cluster. They tend to be either plasma-based or charge-based, with the former offering a slow fire rate and heat-seeking abilities, and the latter packing a harder punch the longer you charge them up. Finally, Remnant weapons use beams, meaning they’re accurate and have a constant fire rate. They also use an overheat system, so need no ammo, but will have to cool down occasionally. From our own time with the game so far, it’s clear that a lot of old favourites are returning. 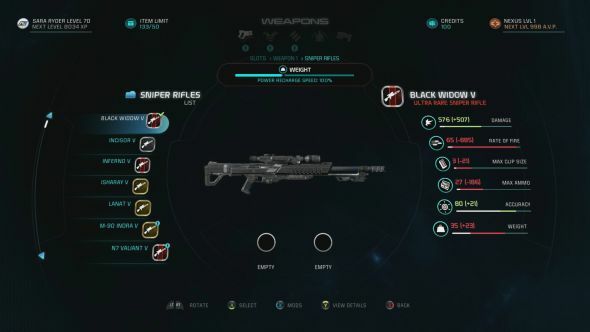 We spotted the Widow anti-materiel rifle, the Revenant LMG, the M-96 Mattock and a number of N7 weapons including the Valiant, Crusader, Valkyrie and Eagle. One of our own personal favourites, the Black Widow sniper rifle, is also back, and we had great fun using the crafting system to modify it to fire lasers – check the crafting section of our preview for more. In short, augmentations can be added to a gun while you’re crafting it, and will permanently change its behaviour. Mods, on the other hand, are temporary, and can be switched whenever you change your loadout. Some weapon mods will change the colour of your guns, butyou can’t choose their colour directly. You can do this with armour, however. Among the toys new to Andromeda are at least two new melee weapons – the Asari sword and the Krogan hammer. There’s more on both in the new Andromeda Initiative weapons training briefing. 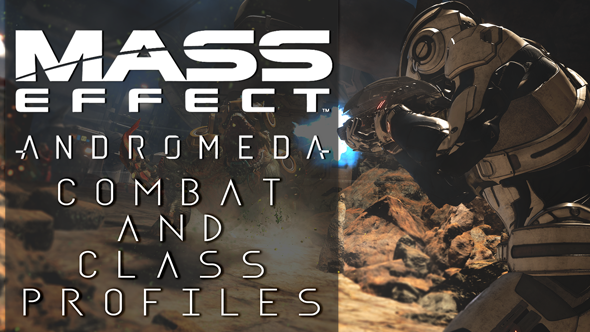 Sources include the weapons gameplay videoand Andromeda Initiative weapons briefing. That’s all we know so far about how you’ll kill stuff in Mass Effect: Andromeda. We’ll be sure to update this guide with any pertinent new information.